Dryland Pasture Mix is one of our best selling products. It’s also among the top ranking for frequently asked questions. This post should address some of those questions and help you decide if it is best for your application. If you would like to order Dryland Pasture Mix, follow this link. Water is the single most precious resource in the The Western US. The Intermountain West is a dichotomy of hot, dry summers and cold, snowy winters. Daily fluctuations are as dramatic as the seasons; in a given day there may be morning frost or ice on the sprinkler heads and daytime highs can be in the 80’s. The Intermountain West covers Montana, Idaho, Nevada, Utah, Wyoming, Colorado, and eastern Washington and Oregon. Our dryland pasture mix is especially suited to these states and the challenging conditions they present. They term “dryland” is relative to the geographic area you live in. It’s a matter of perspective and point of reference. I once had a customer from the pacific northwest call and tell me they needed a dryland species because they were in a terrible drought. When I asked how they defined drought the reply was “we’ve only received eighty-five inches, and the wet season is almost over!” They were genuinely concerned, and in an area that usually receives an average of 175″ of annual precipitation they were, in fact, in a very serious drought. Compared, however, to the arid, high deserts of the Great Basin, 85″ is nearly triple the amount of annual precipitation received even in the worst flood years in recorded history. That much water would drown every living thing in sight and wash us all into the Great Basin hardpan. Once you have established the zone you live in, you can determine which species will grow in your area, and if they will survive solely on natural annual precipitation or if they need supplemental irrigation. Great Basin Seed dryland pasture seed mix is designed for geographic areas where annual precipitation is a minimum of 10-14″ with no supplemental irrigation (flood, sprinkler, etc). If you have more than 14″ then other species are adapted to your climate and you may want to consider an irrigated pasture mix or a custom mix designed for your circumstances. Rainfall in the Great Basin and Intermountain West rarely average more than 14 inches, an in most areas is somewhere between 10-12″ Yes, there are areas that receive as much as 18″, but they are generally high mountain valleys (or actual mountain ranges), and length of growing season and temperatures play as much a role in choosing species as precipitation. Anything less than 14 inches of annual precip is how we define dryland, and our dryland pasture mix will grow on as little as 10″. This is not to say that we don’t offer species that will grow in less than 10″ – we do – but choosing seed for that level of aridity usually requires a custom mix, so we work with you to select the seed species based on the merits of each situation. 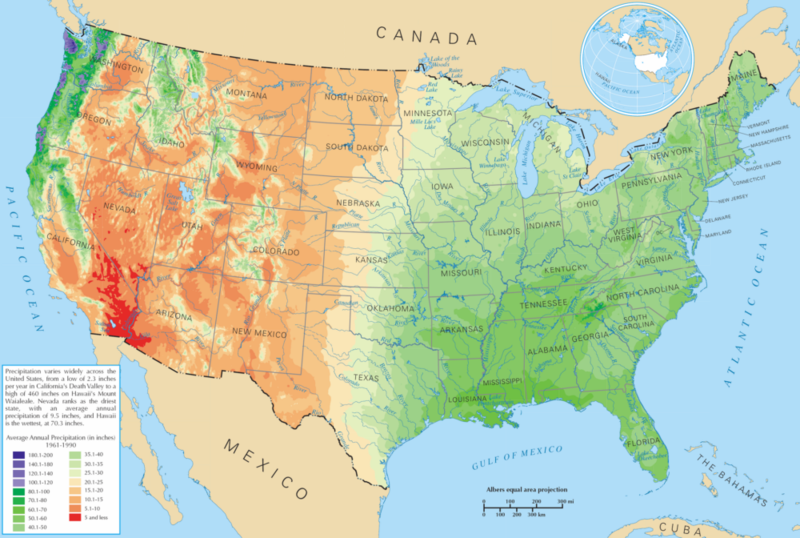 It’s difficult to build a “one mix fits all” product for those geographic regions, which include regions like the mojave and sonoran deserts. The table below is a quick-refence for choosing species based solely on their precipitation requirements. As you look through the list above, you will notice that there are several species that are well adapted to arid landscapes but are not found in dryland pasture mix. Why? One reason is cost. 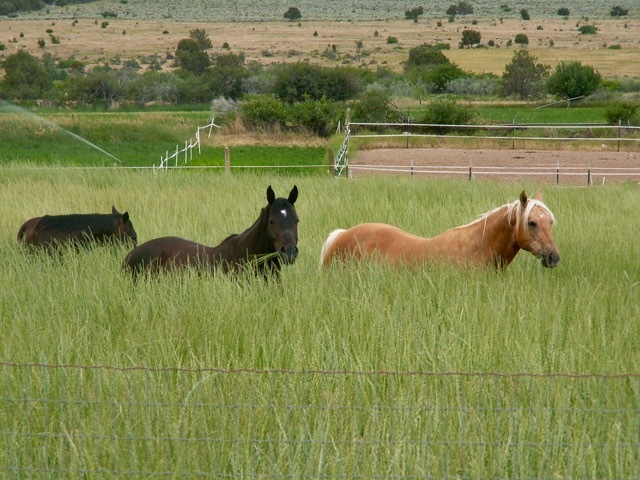 Species like Snake River and Bluebunch Wheatgrass can be very cost prohibitive. We can certainly add them to a custom mix, but they otherwise price a pasture mix outside the range of what the average person really requires. Another reason is forage production. Indian Ricegrass, for example, is one of the most drought tolerant species available to us but produces very little forage, and the forage it does produce is not ideal. Some planting sites fall into the realm of not quite dryland but not quite irrigated, either. I recommend erring on the side of caution. Go with the species that will tolerate droughty conditions and survive on less water. Why? Because part of the selection process also hinges upon WHEN the water comes. If you plant a fescue that requires a minimum of 14″ of annual precipitation, but your water comes in the form of rain in spring or fall, then your fescue will eventually thin out and die over time. It wont tolerate the hot, dry summer months. On the other hand, drought tolerant species will better weather hot summer months, will persist, and produce more forage if they are given supplemental water or are planted in areas with slightly higher annual precip. 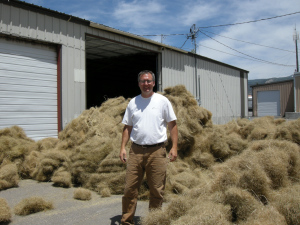 Intermediate Wheatgrass, for example, can be very drought tolerant and will grow on as little as 11″ annual precipitation, but really shines as a pasture and hay grass between 16′ and 30″. Plants, like all living things, have a minimum threshold for survival but the area of maximum performance lies somewhere between extremes. Err on the side of drought tolerance. This dryland pasture mix was given supplemental irrigation. The results are excellent (and apparent). Dryland Pasture Mix provides excellent forage. In areas of 12+ inches of annual precipitation it has been and bailed at least once annually. It can be fall and winter grazed as pasture. Once established it can be grazed in any season, assuming reasonable rotation is allowed for plants to recover. Sufficient green matter should remain through summer months to encourage re-growth, photosynthesis, etc. The ability to cut as hay will depend upon your water, soil profile, grazing habits and any number of environmental conditions. Where sufficient resources are available, a drought tolerant pasture mix is an excellent dual-purpose product adapted to a wide range of dryland ecosystems. It is efficient and multi-purpose. Can I use dryland pasture mix for weed control? Yes. The answer depends on several factors, but the short answer is yes. Dryland Pasture Mix is effective for disturbed sites, restoration and weed control. It competes well with weeds if you can beat the life cycle on invasive annuals and give your seed a head start. Prepare your seedbed and treat weeds prior to planting. Refer to my post an seedbed preparation and sowing. One of the great benefits of a grass pasture mix is the ability to spray for invasive broadleaf species. We do not generally add broadleaves to our pasture mix so it can be spray once the stand is established. Of course, we can add broadleaves to the mix – just know that you will kill them if you spray. Revolution Slider Error: Slider with alias drylandpasture not found. You will achieve best results by drill seeding, but broadcast seeding is the most common method. Take care to plant no deeper than .25″. Prepare the soil with some form of light disturbance such as a spike-tooth harrow. Methods will vary from sit to site and will depend upon your equipment.